It was not easy to make sure that this demonstration took place, because there were a lot of negotiations and phone calls among different organisations and important persons, and nobody really knew until the day before what would be the result. Already some days before the WSF started, it was said that the Organisation Commitee of the WSF itself would organize such a demonstration. 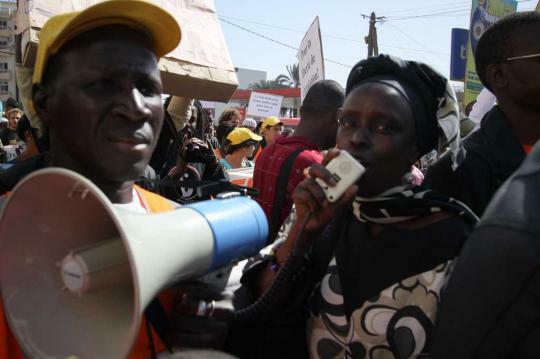 Originally they wanted to call for a demonstration between the French Embassy and the bulding of the EU Commission in the center of Dakar. But the police said that all kind of demonstrations are forbidden in the city center and declared it as a “red zone”. The WSF Comitee did not go against this, but asked for permission for a demonstration between the post office of the Medina (not far from the university, where the WSF took place) to the Frontex office, which is a distance of only some hundred meters. 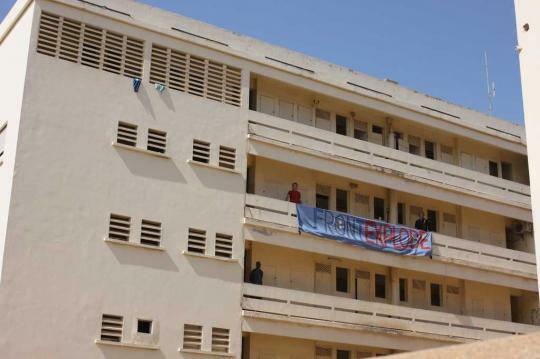 But the police did not want to allow this demonstration, because they said, it would be directed against the Senegalese police (in whose building is the Frontex office) = confront the Senegalese state. The authorities proposed a demonstration to the residence area of some embassies (among them none of the EU), but nobody wanted to do that. 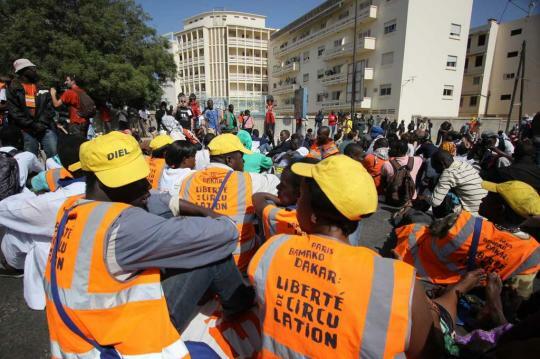 On the last day, Madjiguène Cisse and others of the WSF Commitee proposed a demonstration from the post office of the Medina through a quarter with a poor population = people, who want to migrate. The police rejected this proposal, but accepted after some more phone calls the demonstration to the office of Frontex. We as network afrique-europe-interact had already mobilized for the demonstration with a lot of posters and flyers, before it was allowed. And we organized a march of some hundred people with our own loudspeaker, banners and leaflets from our camp to the meeting point at the post office – and so we went without any permission exactly through the area, where a lot of poor people live, and all of them were very interested in our demonstration, wanted to have the leaflets and some of them even joined the demonstration and shouted with us against borders and Frontex. The demonstration of 5-800 people, which was allowed, took less than half an hour from the post office to the police building with the Frontex office. When it arrived there, our banner “Frontexplode” was hanging from a balcony for some minutes, until someone of the staff realized it – and gave it back to us! I hope, some photos will be soon on our website! In front of the building, we had a minute of silence remembering the dead people at the borders, whose names were written on a big banner, which we carried already in Nioro (at the Mauritanian border). Then activists of different organisations held speeches. The police was present with about 100(?) well armed people all the time, but did not intervene. Concerning workshops on Frontex and borders, there was the one which we co-organized together with Alternative Espace Citoyens from Niger, Migreurop and Cimade from France, called: “Instrumentalisation of insecurity / militarisation of borders”. It took alread place at 8.30 on Monday = before any programm of the workshops came out. So we produced a lot of flyers and distributed them on Sunday on the WSF area, and only because of this a lot of people (more than 100) came. The room which was announced was occupied by students, so we had to look for another room, and there we were almost driven out in the middle of our inputs. The activists from Niger talked quite long and not very concrete about the situation at the border, different interests and the history of this region. Migreurop and Cimade gave information on other borders, the “Plan Afrique” and Frontex operations. Our input about Frontex and actions against it (luckily the beamer worked and we could show photos) came in the end and was the only one with proposals and examples what can be done against Frontex. I had the impression that many participants (Africans and Europeans) were interested in this and came to the demonstration on the 10th of February. The next day, I attended a workshop, which was also about borders: “Frontières – zones de fractures?”, in which activists and migrants from Mexico, Niger, Morocco and Mauritania compared the situation at these borders and told about organisations and activities of migrants and supporters. The debate was well organized, among other organisations by the ABCDS from Oujda, and a lot of migrants, especially some who are in Nouadhibou/Mauritania, participated and critisized, how the policy of the EU and the collaboration of states like Mauritania and Morroco blocks the freedom of movement, not only at the borders, but already in towns like Nouadhibou: Every black person, who walks on the streets, is seen as an “illegal migrant”, can be arrested and deported. I told about our caravan and announced the Frontex demonstration in this workshop and a lot of the participants wanted to take part.